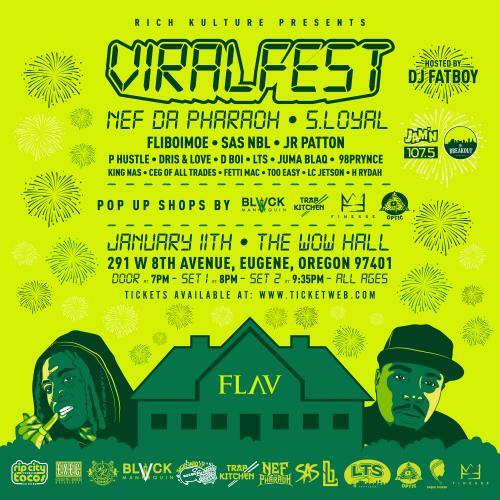 On Friday, January 11, Rich Kulture presents Viral Fest featuring Nef Da Pharaoh along with S. Loyal, Fliboimoe, SAS NBL, Jr Patton, P Hustle, Dris & Love, D Boi, LTS, Juma Blaq, 98Prynce, King Nas, Ceg of all Trades, Fetti Mac, Too Easy, LC Jetson, H Rydah; hosted by DJ Fatboy. It's been nearly three years since Nef The Pharaoh took the Bay Area by storm with his breakout hit "Big Tymin'”. Since then, under the tutelage of E-40, the South Vallejo rapper has become an ambassador of the region in his own right, championing artists like SOB X RBE, OMB Peezy, and others. The Vallejo rapper’s long-awaited debut album The Big Chang Theory was released August 10 on KILFMB/Sick Wid It/EMPIRE. Doors open at 7:00 pm and showtime is 8:00. Tickets are $18 in advance, $23 day of show, and $100 for meet & greet.